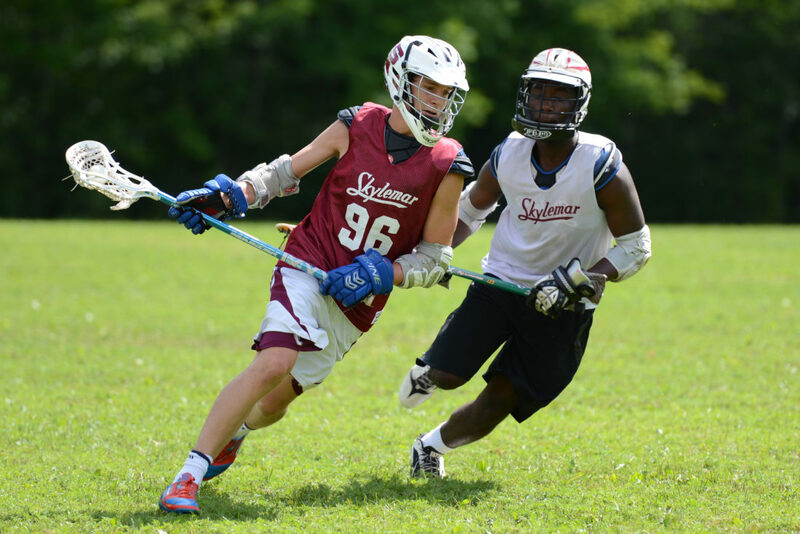 Photo by Shannon Rathmanner In this Aug. 2014 photo, two athletes compete in a lacrosse game at Camp Skylemar in Naples, Maine. Skylemar is a summer sports camp for boys. MARSHALL – When I was a senior in college, my post-graduation life was shrouded in mystery. I had just one semester left in school, but I was terrified by the unknown that was next. All of my friends had jobs already lined up or options on the horizon, but the only thing I knew for certain was that I needed an internship to graduate. I knew I was being exceedingly picky, but the internship I was looking for had to let me take photos, must involve sports, must be fun, had to be paid and should be nowhere near Minnesota. Seems like a bit of a stretch, right? It wasn’t that I was trying to run away or leave home, I was just a 22-year old photojournalist major who had no idea who I wanted to be or what I wanted to do with my life. So I decided to pursue the path of adventure – the path that would, hopefully, help me figure out what kind of person I would become. I applied for internships in Seattle, Houston, New Orleans and Honolulu. And then I came across a sports photographer position at a seven-week summer camp in Naples, a little town in southeast Maine. It was certainly something I had never done before and I had heard only pleasant things about Maine, so I decided to fill out the 11-page application. Having the chance to take photos and positively influence the life of a child in a place I’d never been before seemed like just the adventure I needed. Little did I know that filling out that application would be the best decision I’d ever made. A few months after being offered the position, I packed up a rented car and a friend and I headed out East. I began to feel the sense of adventure from the moment we got into the car. On our way, we stopped to watch a baseball game at historic Wrigley Field in Chicago and at PNC Park in Pittsburgh. We experienced the unparalleled beauty of Niagara Falls, drove though the gorgeous nature of upstate New York and Vermont and hiked in White Mountain National Park in New Hampshire. By the time we drove up the long gravel driveway of Camp Skylemar, I was already feeling like I made the right decision. In just four days, I’d crossed off a handful of dreams on my bucket list. But my amazing summer was just beginning. The staff that had already arrived were eating dinner in the rec hall, and when I entered, I was greeted by Luci, the camp director’s daughter, who gave me a hug and welcomed me to camp. After dinner, I was given a tour of Skylemar. It was like something from a dream. The land was covered in not only acres of green grass, but tall, beautiful trees. There were fields, courts and rinks for all kinds of sports as far as the eye could see. The waterfront was right on an unbelievably clear pond with sailboats, kayaks and canoes afloat. On the other side of camp, there was this little path through the woods that led to a small clearing on that same pond. I was unaware at the time that sitting on the old stone wall looking over the pond at that very spot would one day become my favorite place in the world. The summer went by in a flash. Before camp even started, the group of counselors became a group of 100 friends. We spent a whole week before camp at counselor orientation just getting to know each other. By the time the kids arrived, we were family. And that family grew to a group of 300 within hours. I spent the summer taking photos of sporting events, talent shows, carnivals and contests. I took photos of people of all ages building lifelong friendships, cherished memories being made and the joys in the eyes of a child getting up on water-skis for the first time. I got to teach kids how to use a camera, how to edit photos on a computer and even how to solve a Rubik’s Cube. We were in our own little world, and we were all OK with that. When the closing banquet night came, we all got a chance to reflect on the amazing summer we each had by watching Retrospect, a movie put together by the video crew all about the previous eight weeks. It was a truly magical night. The next morning, it was time for all the kids to go home. As they were all loading on to buses to take them back to the real world, I took photos of kids and counselors alike who all loved each other. There were counselors and kids saying tearful goodbyes to people who, just eight weeks earlier, were strangers to them. When the first bus was pulling out of camp, tears filled my eyes as I realized something unbelievable. When I took that job, I did so in hopes of being a positive influence for a child and make a difference in their life. But while watching the kids wave as the bus drove away, I realized that it was them who had made a difference in mine. I wasn’t the same person I was eight weeks earlier; I was beginning to form into the person I would one day become, and it was all because of those kids, those counselors, and Camp Skylemar. I spent two more incredible summers at camp, and with the more I grew and learned, the more important my time at Skylemar became. Camp was only seven weeks long, but those seven weeks were the best part of my year, every year. However, after my third summer, I knew it was time for me to find a full-time job. I couldn’t fill the 10 non-camp months bartending and just waiting around for camp anymore, as much as I wanted to. So I applied at the Marshall Independent and got the job. I packed up, said my goodbyes and moved to Marshall. I have thoroughly enjoyed my time at the Independent. I’ve met some wonderful people, worked with some of the hardest-working people I’ve ever met and I’ve had the chance to cover some amazing events. I took photos when the Marshall Tiger football team beat Hutchinson in the section finals in 2015 to go to their first state tournament since 1991. I got to cover the Marshall boys basketball team go into a four-overtime classic against Waseca in the section championship that would end up all over ESPN later that night. I spent three days at the state wrestling tournament last February and witnessed Mark Hall become the only wrestler in Minnesota high school history to win six straight individual state titles. Yet through all of that, a little part of my heart was still on that plot of land in Maine. And then I got a phone call from Arleen, the other camp director at Skylemar. She explained to me how camp wasn’t the same without me, and she would do whatever it took to get me back – full time. So she offered me the position of Director of Media and Marketing. My mind immediately flashed back to all of my amazing times at camp. I thought of the kids I missed so much and the breathtaking view from the bunk line of the sunset over the mountains. I thought about my time off with the other counselors when we would spend our days walking around Old Port in the picturesque city of Portland on the southern coast. I thought about when we went cliff jumping at Salmon Falls and floating on a tube down a river in mountain country. I thought about spending our days at the ocean and about eating the freshest seafood you can imagine in a charming little restaurant on the bay. I thought about that little path in the woods that led to the clearing, and sitting on that old stone wall looking over the pond. Just like that, I was there again. I was back at the place that started as just a summer internship, but turned into the place that made me who I am today. I knew that saying my goodbyes here would be tough, but I also knew that Camp Skylemar was where I belong. So I accepted the position. Before I leave, I want to thank everyone at the Marshall Independent. I want to thank former editor Per Peterson for giving me the opportunity to move up to sports editor and for teaching me so much about the position. I want to thank Josh VanKlompenburg for making our nights taking calls and emails infinitely easier. I want to thank Gary Kaczmarek, Kyla Gundvaldson and Jenny Kirk for covering games and always staying positive, no matter the circumstances. I want to thank Sam Thiel, who came in as our full-time sports reporter in August and picking everything up so quickly. Sam will be moving up to take over the sports editor position, and I know he’ll do a wonderful job. A special thanks goes out to Kelly Loft for always helping us out with SMSU sporting events. I want to thank everyone else in the office who has made my job easier. I’ve truly enjoyed working with each and every one of you, but it’s time for me to go back to the place where I am truly the best version of myself. It’s been one year, three months and 20 days since I last stepped foot on Skylemar soil. Each and every one of those days, I’ve thought about when I’d be able to drive up that long gravel driveway once again. With this opportunity, I’ll get that chance. With this opportunity, my future is finally becoming clear. At last, I can lift the shroud and see what lies beneath. At Camp Skylemar, I will continue to grow, learn, and mold into the person I was meant to be.